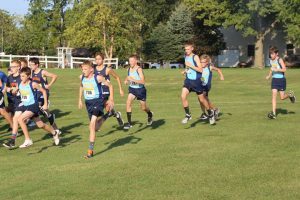 L-S cross-country returned to the field of competition this past Thursday, Sept. 21, at PCM. Recent warm weather has made competitions more challenging than what would normally be anticipated for the beginning of fall, with the meet at PCM being no exception. With the temperature at the meet hitting 90 degrees and humid, athletes were encouraged to stay hydrated and conserve their energy. The girls team persevered in the heat to finish in fourth place out of seven teams. Senior Mary Kate Shaver finished in fifth place with a time of 22:46, and sophomore Abby Gruver crossed the finish line in 17th place in 25:15. She was followed by freshman Megan Van Zante, who completed the race in 19th place with a time of 25:33. “The course was better than both Colfax and Diamond Trail because it had less hills,” said Gruver. Senior Christine Nikkel placed 32nd with a time of 26:50, and junior Emily Van Gorp was close behind, earning 34th in 27:21. 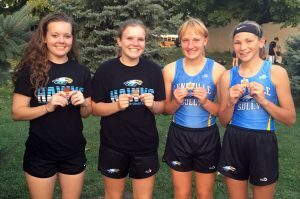 Mary Kate Shaver, Brittney Hansen, Abby Gruver, and Megan Van Zante pose with their medals after the PCM meet on Thursday, Sept. 21. Senior Haley Breeden and sophomore Abigail Davis finished 35th and 37th respectively. Breeden finished in 27:25 followed by Davis in 27:45. Sophomore Brittney Hansen finished in second place for the JV with a time of 28:00. Senior Hailey Scandridge pushed to finish the race with a final time of 31:05 and placed 24th for JV, followed by freshman Hadley Tice, who ran 32:43 for 32nd in the JV race. This was only the second meet of the season where the L-S boys cross-country team was able to compete with a full team of five. They finished in ninth place out of nine as a team at PCM. “It was hot, but better than my first race,” said Kuhlmann, who finished 74th in 23:11. Senior Josh Dunsbergen placed 37th with a final time of 21:35, followed by junior Joseph Anderson in 54th and freshman Mason Jansen in 57th, finishing with times of 22:27 and 22:33, respectively. Freshman Luke Kramer ran a time of 28:08, finishing 107th. L-S junior high runners were also at PCM, running a 3K. James Gruver won the boys’ side of the race in 12:13, his second meet win of the year. He was followed by Gentry Walston (14:21, 21st), Josh Hardenbrook (15:15, 30th), Ryan Annee (16:20, 38th), Zach Morningstar (16:56, 42nd), and Evan Fikse (18:53, 49th). On the girls’ side, Greenlee Smock claimed third in 14:12, Kinsley Tice took 12th in 16:17, and Reagan McFarland placed 17th in 17:06. L-S junior high boys at the start of the PCM race are, from left: Gentry Walston, James Gruver, Josh Hardenbrook, Ryan Annee, Evan Fikse, and Zach Morningstar.